Co-authors Dr. Jem Bendell and Ian Doyle. Published by Fair Jewelry Action and Lifeworth Consulting. 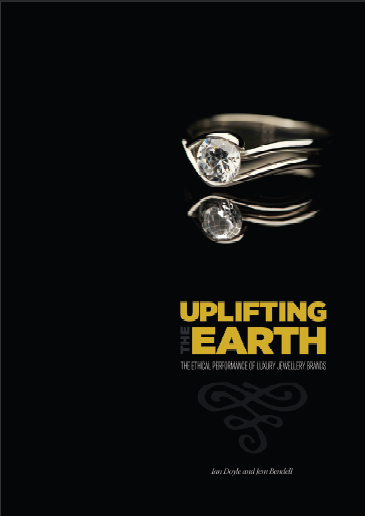 Uplifting the Earth: The Ethical Performance of Luxury Jewelry Brands was a report done in 2011 which benchmarks ten prestigious jewelry brands according to their social and environmental performance: Boucheron, Bulgari, Buccellati, Cartier, Chanel, Chopard, Graff Diamonds, Harry Winston, Piaget and Van Cleef & Arpels. It compares their performances with innovations in the ethical sourcing of precious metals and gemstones, and finds them significantly behind, with the exceptions of Cartier and Bourcheron, which are recognized for taking useful steps. The report also provides guidance on how brands can move away from a negative risk management approach to their ethical considerations, and instead use social and environmental issues as a creative inspiration and collaborate to make jewelry a positive force. Co-author Dr. Jem Bendell explains that one reason for the lack of comprehensive action from prestigious brands is identified as the absence of a positive vision for the ethical role of the jewellery industry. Although a decade of effort to reduce conflict and environmental damage from jewellery supply chains has curbed some of the worst practices, it has failed to identify an aspirational role for jewellery. Today, the efforts of responsible jewellery pioneers are outlining a vision of ethical excellence. By comparing the actions of ten luxury brands with this new vision, the report finds luxury jewellery firms risk being left behind in an increasingly aspirational marketplace. More people recognise something is beautiful if it has been made beautifully, which involves all aspects of its creation. Some in the industry understand that, and need help to get buy-in from their colleagues. This report is for them. Because there is so many more facets of information included in the report, I highly recommend reading the entire report for yourself. Pages 36 – 48 details the benchmark for each luxury jewelry company in what they are doing and how they stand in corporate responsibilities.